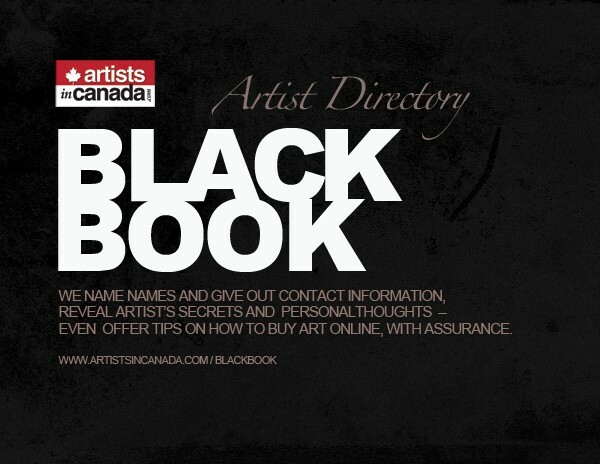 The black book ecatalogue will be out this spring featuring some great art by our artist members. The world has turned electronic, this goes for art magazines and ad literature. Since 2015, Artists in Canada has produced an electronic version of our previous artist catalogues. It has only been the past 2 years that we stopped publishing the printed version on paper. We found that after an art event people started emptying their bags out in the recycle and garbage bins and some of our booklets were in there as well. Todate, our ecatalogues have been read over 27,500 times, just from the link on Artists in Canada. It doesn't matter how beautiful the production is, it eventually is discarded or it sits on a shelf collecting dust. With our ecatalogue it has so many advantages over paper. It is one thing if it is intended as reference material, but initially it is time sensitive material intended to sell and present an artists work. It can be read by multiple people, shared socially on line, attached to emails to customers and in newsletters. It can be archived for future reference and surprisingly reach a wider audience much faster. With the ad pages by artists you can click directly to their website and contact them through their site or contact email. Purchasing or answering inquiries can happen the moment a request is sent. The bonus of our ecatalogue is that we produce this in high resolution images, so people can request a paid printed copy or they can print off the pages they want. This is all handled by our supplier. For now, you can view past issues through this link. Past Issues. We look forward to another great publication.